Kubota paints are a general-purpose finishing enamel. They were developed as fast drying, versatile, industrial coating paint for manufacturers of metal products. The enamel offers a quick dry time, high gloss and good color and gloss retention. Kubota paints are ideal for industrial OEM uses, including agricultural and construction equipment. 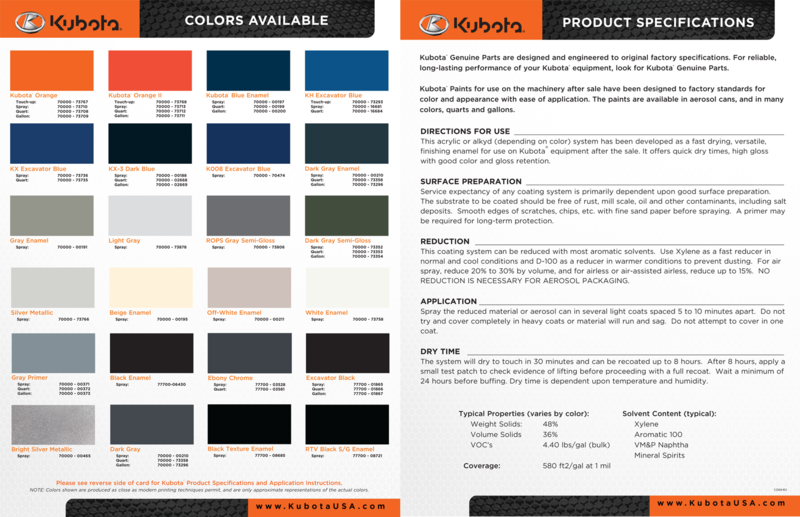 Kubota paints (for use on the machinery after sale) have been designed to factory standards for color and appearance with ease of application. The paints are available in aerosol cans in many colors, quarts and gallons. Surface Preparation: Service expectancy of any coating system is primarily dependent upon good surface preparation. The substrate to be coated should be free of mill scale, oil, rust and other contaminants. Smooth edges of scratches, chips, etc. with fine sand paper before spraying. A primer may be required for long-term protection. Reduction: This coating system can be reduced with most aromatic solvents. Use Xylene as a fast reducer in normal and cool conditions and D-100 as a reducer in warmer conditions to prevent dusting. For air spray, reduce 20% to 30% by volume and for airless or air-assisted airless, reduce up to 15%. NO REDUCTION IS NECESSARY FOR AEROSOL PACKAGING. Application: Spray the reduced material or aerosol can in several light coats spaced 5 minutes to 10 minutes apart. Do not try and cover completely in heavy coats or the material will run and sag. Do not attempt to cover in one coat. Dry Time: The system will dry to touch in 30 minutes and can be recoated up to 8 hours. After 8 hours, apply a small test patch to check evidence of lifting before proceeding with a full recoat. Wait a minimum of 24 hours before buffing. Dry time is dependent upon temperature and humidity.